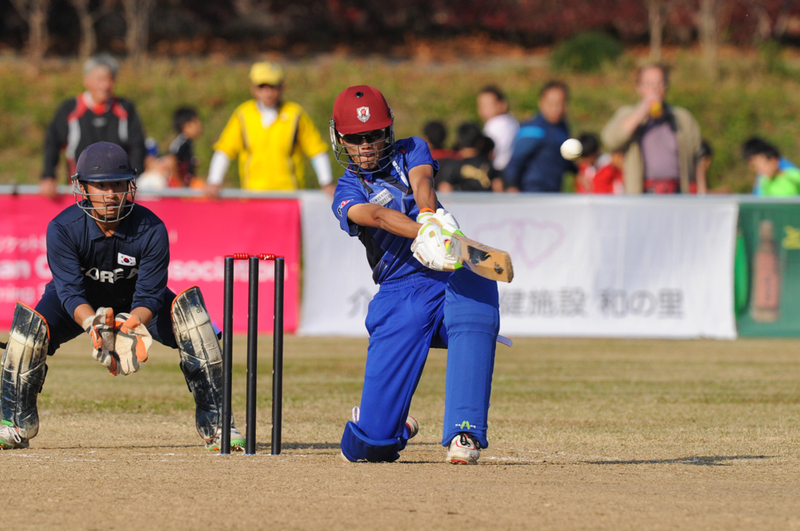 In the next five years cricket will become a part of life for a whole new audience in Japan. Opportunities for all, provided by creating innovative formats, will enable cricket to be recognised as accessible, fun and inclusive. 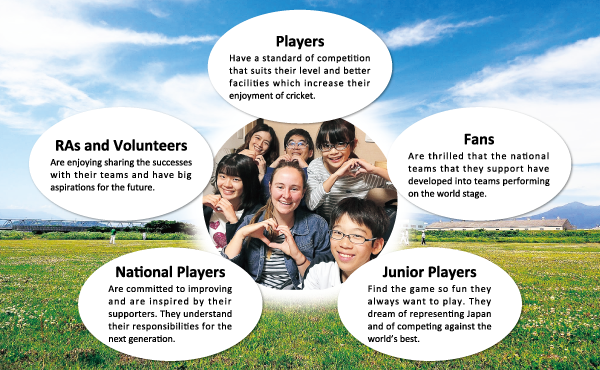 As part of a global community cricket will inspire the biggest possible dreams for its future generations. *Please click here to download the full strategy document. The National Teams are our flagbearers. We will develop teams that inspire the next generation of fans and players by being role models and high performers. Our people are our greatest asset and will drive us towards our goal. 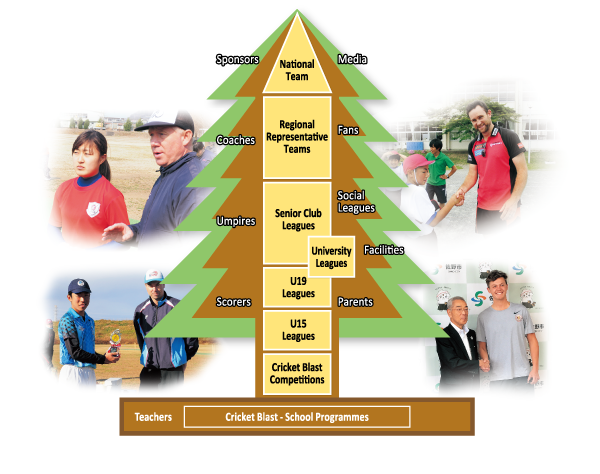 We must develop administrators, coaches, scorers, umpires and volunteers who have a life-long love of cricket and a desire to help the sport grow in Japan. Promotion is the vehicle which will carry us forward. We must educate the Japanese public about cricket and its opportunities, and engage with our wider audience both at home and abroad. Using a variety of media outlets to grow our fanbase and foster dreams of competing at global events. 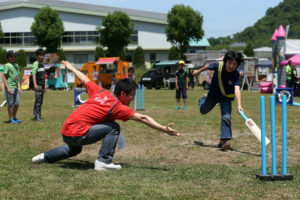 Cricket Blast is the first step onto the pathway to a life-long love of cricket. As the foundation of junior development we will take the programme to new places and grow participation in this fun, entry level format designed for 6-12 year olds. We will also expand the number of Junior Clubs which provide regular practice and playing opportunities in the existing junior leagues. Cricket must not be held back by tradition. By creating modified formats we expect a significant growth in participation. We will embrace innovation to create a unique social experience which is both simple and safe for participants. We can then harness all opportunities to create leagues and bring businesses, communities, and cultures together. More facilities will mean more people playing the game in more places. 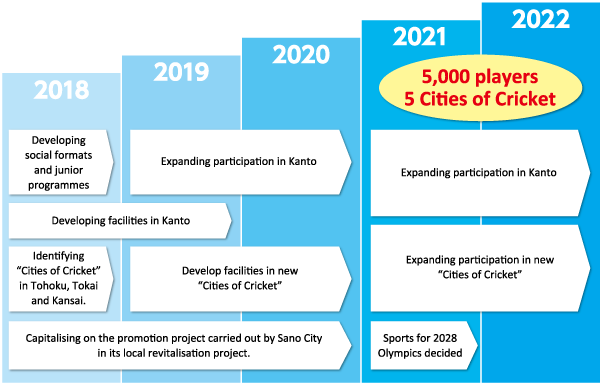 Focussing our resources to work with local councils and communities into creating “Cities of Cricket” will ensure that Cricket contributes to the local community in a multitude of ways, primarily sports tourism and opportunities for children. In identifying core hubs for playing, training and modified formats we can make the game more accessible to a wider audience. For a sport to develop it must be in the public eye. There needs to be touch points where people can experience it for the first time and these must be suitable for all abilities, ages and genders. 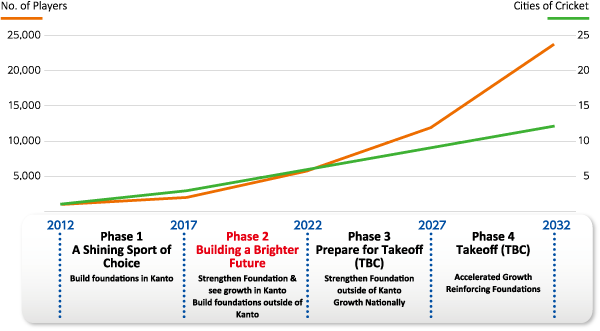 Additionally there must be facilities, fans, leaders and sponsors in order to sustain development. Using the example of a tree, the players begin at the roots and travel up the trunk, but it is the branches that create a healthy tree. 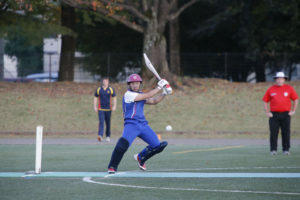 The JCA strategy for 2013-2017 was to make cricket a “Shining Sport of Choice”. To do this there was a heavy focus on the roots of the tree, developing a junior program that would provide a solid base for a long life. 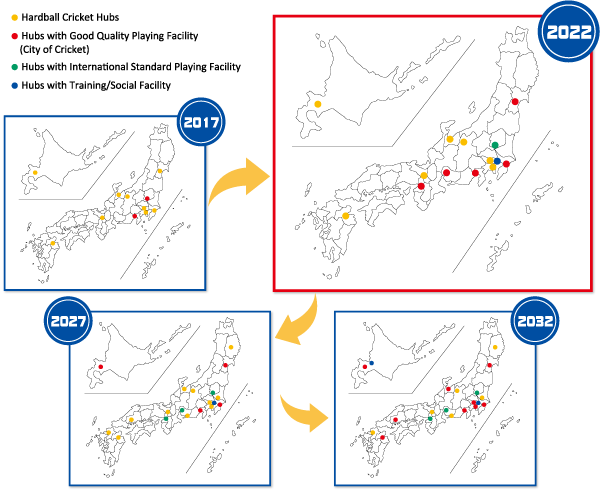 The focus was predominantly in the Kanto region and creating regional hubs. In 2018-2022 the JCA are ” Building a Brighter Future”. This will require nurturing the growth of the tree and supporting it to grow, while also looking at new areas outside of Kanto where the land is fertile and able to sustain the growth of future trees. A focus will be on attracting unprecedented levels of participants through innovative and exciting social formats. People should be playing for pure enjoyment, and not be held back by traditional thought processes. The growth of a tree takes time, but they can live for centuries. The next five years will see our trees start to develop more branches and eventually grow into forests. For those involved in cricket today, the next five years will bring an enormous shift in what they believe is possible in the future.